This is Pluto in Charon in real color, but exaggerated to emphasize the compositional differences. The image was taken by the New Horizons probe early in the morning of July 13, 2015 before its historic flyby. 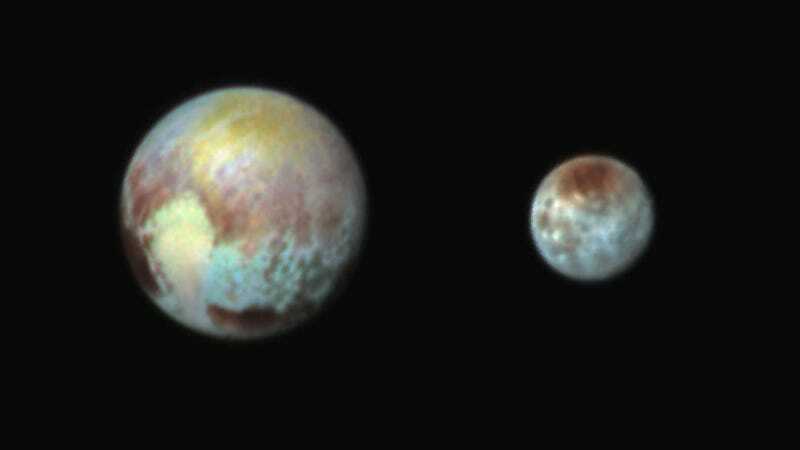 At 3:38 am ET on July 13, 2015, the New Horizons probe used three color filters on its Ralph instrument to capture the data for these enhanced colour images of Pluto and its largest moon Charon. The image is real colour, but not true colour: the red filter is mapped to red and so on, not lights remapped to entirely different wavelengths like we do with non-optical X-ray or infrared data. However, this isn’t at all what you’d see with your naked eyes: the colors have been cranked to extremes to emphasize compositional differences. This is also composite image, where the Pluto and Charon have been placed at the same scale but with a reduced distance between the worlds. We make these color images to highlight the variety of surface environments present in the Pluto system. They show us in an intuitive way that there is much still to learn from the data coming down. These images show that Pluto and Charon are truly complex worlds. There’s a whole lot going on here. Our surface composition team is working as fast as we can to identify the substances in different regions on Pluto and unravel the processes that put them where they are. Considering the images were received on the ground at 12:28 am ET this morning, we can probably give them a bit of slack! With that as a cautionary, “Everything we say now may be wrong later,” here’s a very preliminary analysis. All the colours in the image are real, just with saturation cranked way up to extremes to emphasis any differences. This means the images look nothing like the objects do in real life, but does make it easier to spot compositional changes even if we don’t know what they mean yet. The now-iconic heart of Pluto is the biggest surprise: instead of one coherent region, the heart is distinctly broken in two, a peachy western lobe, and a mottled blue eastern lobe. The dark red patch directly below the eastern lobe already has an informal name: Krun, named for an Mandaean lord of the underworld. The oddly patterned band in the southern hemisphere middle latitudes is now an motley stripe of pale blue and rusty red. Surprisingly, the eastern lobe of the heart almost looks like it’s disintegrating into that band of blue. The rusty reds might be photolyzed ices, but it’s going to take more observations from different instruments to confirm that. As for what’s going on with the colour segregation, the geology team have been so busy talking to the media about the images that they haven’t had a time to sit down and study them yet! Initial guesses include that some form of thermal segregation might be going on. The northern polar cap (recently confirmed to be a mix of methane and nitrogen ice) covers a wide range of yellow-oranges in fairly distinct zones. This suggesting that it’s more compositionally mixed than our first impressions, and might reflect segregation processes from freezing and sublimating over time. Of Pluto’s five known (so far!) moons, Charon is the undisputed giant, large enough to almost turn Pluto-Charon into the first binary dwarf planetary system. It, too, was a subject of Ralph’s enhanced colour imaging. The dark northern polar cap on Charon is one of the biggest scientific surprises of the mission so far. It’s newly-revealed red tone is leading the mission scientists to wonder if it’s composed of hydrocarbons, possibly even tholins. Tholins are complex molecules formed when methane and nitrogen (the same materials we’ve identified on Pluto’s pole) are exposed to ultraviolet radiation. The molecules are small enough that they can remain aerosolized, and are one of the reasons why we find the clouds of Saturn’s largest moon Titan so intriguing. The otherwise mottled surface indicates Charon is a far more complex world than we assumed earlier this week. It’s looking that Charon has a much older, more battered surface than Pluto, while Pluto’s smoother surface may indicate more active processes that erase signs of its age. One of the differences between the worlds might be that Pluto has an atmosphere that freezes out and obscures the surface and Charon doesn’t, but that’s one of the ideas we need far more observations to investigate. People are curious why so many of the latest, greatest photographs of the Pluto-Charon system are in black and white. The reason is which camera is in use: the LORRI camera has higher resolution and can see in more detail, while the Ralph instrument can’t zoom as far but can capture full colour. The three colour filters also mean that Ralph’s data is larger, so it takes longer to send home. Since the probe can only collect data or communicate, not both, only the highest-priority, ultra-compressed failsafe data is being sent to Earth: we’ll be getting more Ralph colour images in the months ahead when the probe cuts back on the science and focuses on downloading all that juicy data. 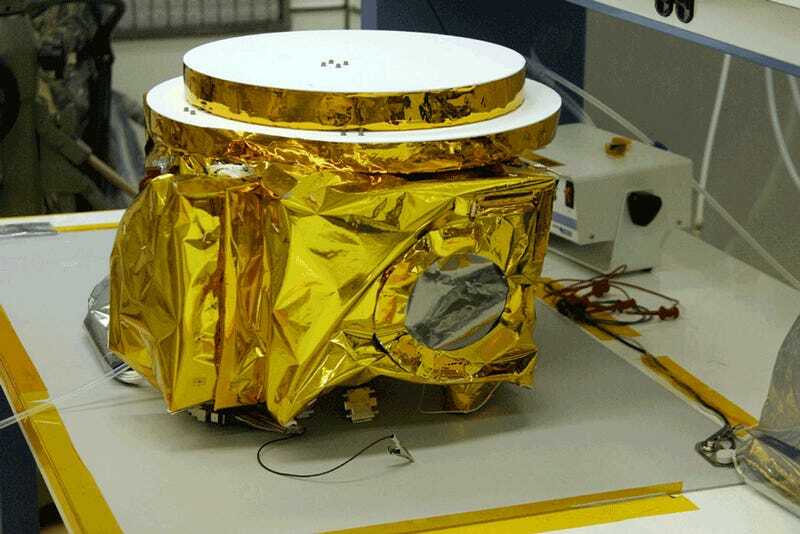 It will take approximately 16 months to get all the flyby data home. Right now, the New Horizons probe is past its closest approach to the Pluto-Charon system, and is barreling farther into deep space. It’s still busy collecting data, but will stop, turn, and give us a quick, “I’m alive!” ping this afternoon. Approximately 4.5 hours later, we’ll hear that ping on Earth via the Deep Space Network. Here at io9, we’re downright giddy with Pluto-excitement, and will be hosting a live-blog of the first call home with plenty of science, stories, and excited squealing to keep you entertained while waiting. Join us on io9 for a live-blog when New Horizons calls home at 8:30pm ET/5:30pm PT tonight!